Yes. There is a notary public available at City Hall daily from 8:00 am to 5:00 pm. There is no fee for this service. Photo identification is required. Coes the City make copies? Yes, the City can make black and white standard sized copies for $.10 per page. Does the City provide faxing service? Yes, the City provides both outgoing or incoming fax services. The fax number is 316-747-3159 and the fee is $1 per page. Is there a complete listing of common City services and fees? Yes, click here for a PDF file listing common services and fees. I'd like to rent a house in Douglass. Is there a landlord listing available? Yes, call City Hall at 316-747-2109 to obtain a list of current landlords. This list is available in hard copy form, or by fax or e-mail. The list does not provide available (ready-to-rent) listings, but instead lists rental landlords and phone numbers as well as rental addresses. The Community Building is owned and managed by the Douglass Township; not the City of Douglass. Please call Jeremy Megli at 316-641-3902 for available dates and pricing. The City’s snow removal policy is to remove snow and treat for ice on all streets in the City. The intent is to make the streets as safe as possible during winter storm events. The top priorities are commercial areas, followed by residential streets. Please park cars off the streets where possible so snow can be plowed to the curb and edge of pavement. The City is not responsible for removing snow that has been plowed into driveway areas. Cul-de-sacs are difficult in terms of snow removal and may not receive the same treatment as other streets. First Street through town is maintained by Butler County. 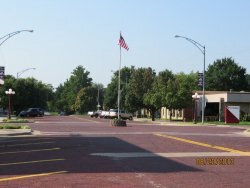 Highway 77 going through town is maintained by the Kansas Department of Transportation. Can I keep farm animals (chickens, goats, sheep, etc) inside the City limits? No. These animals are prohibited by Ordinance. Can I burn my trash or yard waste? No, open burning is prohibited by the City's ordinances. Trash service is provided by Waste Connections through the City of Douglass. A brush and limb disposal is located at 1400 S. Maple Street for the convenience of city residents to dispose of routine yard waste.